Another great gap loft selection. 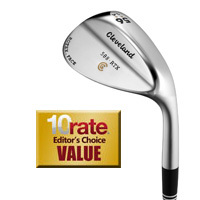 The Cleveland 588 RTX definitely rivals the Vokey wedges in precision craftsmanship. These wedges are precision forged from 1025 carbon steel for incredibly soft, solid feel and have a very stiff tour concept shaft and zip grooves. These wedges are better for a player with a slightly steeper angle of attack – with higher bounce angle.